Heart Box, Hugs & Kisses -2399 Discounts Apply ! 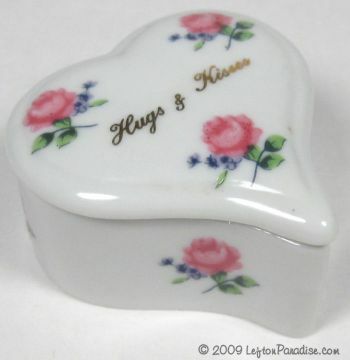 Elongated heart box decorated with pink roses and a message in gold, "Hugs & Kisses". The flawless box is 2 inches across, is marked 2389 with a Lefton gold crown logo.